Last month between classes, I used my break with my Swiss friend Sonja to take a trip across Oman to the eastern island of Masira. A lot of times when I look at a map I see some obscure, remote location and think, “Wow, it would be cool to go there.” For this trip, I finally did that, and for that reason it was one of the coolest trips I’ve been on! Masira – marked by the little blue dot! We made our trip with a rented car from the university and started on Saturday, March 12, driving about 5 hours until we reached the eastern edge of the Sharqiya region to take a 1.5 hour ferry to Masira. Throughout the whole trip we split up our driving about 50/50 between the two of us. Our trip wasn’t so easy though because we ran into a heavily flooded wadi blocking the road through the desert. We were quite afraid to cross because we could see both a half-submerged bus and a half-submerged truck on opposing ends of the wadi. There were also a group of people trying to pull the submerged truck out of the water with rope, which they eventually managed to do. We decided to wait until that was finished and until we saw a car of the same size as ours cross safely before we would try, and we did as well. It probably would have been safer to turn around, but at the very beginning of our trip with our hotel reservations already arranged, that wasn’t an option! We made it through with no issue, though, but it did cost us an hour or two of extra time waiting. Luckily we had supplies to have a little picnic while we were sitting around. We missed the ferry we had originally planned to take, but there was another one that left around 5:00. On the ferry to the island! By the time that we made it to the island, it was getting dark, and we had a hard time finding where we planned to stay, a place simply called “Beach Camp” (with no Arabic name). We drove south until we saw a sign on the road pointing us towards the camp. It turns out that it really was right on the beach, meaning we had to drive our little Acura car through a sand-road late at night (not without almost driving into the water)! We found it eventually, had dinner, and went to bed. We stayed there for the following three nights. Staying at the Beach Camp, especially for the first two nights, was great! We got the “deluxe” room for the first half of our trip, complete with its own air conditioning unit and bathroom. After that, we stayed in the room with just two simple beds and some shelves with separate bathrooms in other little huts outside, which was much more of a “beach camp” experience. We stayed there at the “off” season, so it was really just run by one guy – an Indian man from Kerala named Sadek who spoke decent English and Arabic. The four days sort of blended together, so I’ll recount the most interesting experiences in that span of time. We began each day by having breakfast at the camp – Sadek made very good pancakes! We spent a lot of time driving around the island and visiting the various beaches – we were always the only people on all of them! The beaches were pristine, and the water was clear and blue. I’d never been to a beach like that in my life – I’m used to Litchfield, Myrtle Beach, and Charleston, which are nice, but the water is always cloudy and the beaches are always crowded. I think I was spoiled by my experience there – no other sounds than the crashing of the waves, nothing else to see but the sand and the sea. 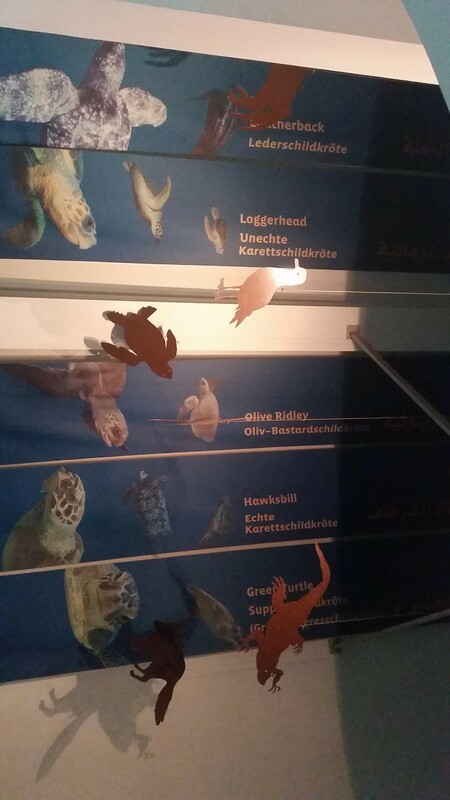 We didn’t see any living turtles, but a few skeletons! The Island was very small – it only takes about 30 minutes to drive from one end to the other! It’s geography was interesting – there were mountains in the middle, but most of the rest of it was desert. Surprisingly, it actually wasn’t much different from the rest of northern Oman. We spent one afternoon visiting the only sizable village on the Island – Ra’as al Hilf. Honestly it wasn’t really much different than the rest of Oman, but I did have some good fish at a little cafe on the street. As I was waiting for my food, I greeted an older gentleman in Arabic. After learning that I speak Arabic, he insisted that I go visit him in his house for coffee and dates right then, but I told him I was still waiting to eat. He said he would return after visiting the supermarket, but unfortunately he didn’t return after an hour so we had to leave. It was a nice exchange, though! That evening we had a nice dinner at the Masira Island Resort – I had a beer with some good Indian food. Through the beach camp I also made a new Omani friend – a fisherman named Hilal (which means “crescent” in Arabic, an awesome name in my opinion). He came by the camp the first night we were there, and was very interested in talking to me about my opinions of life in Oman, what I know about Islam, what I do in the United States, and so on. I spoke with him the following few nights. It was a little hard for me to understand him because he has a fairly different dialect of Arabic than what I’m used to, and he prefers not to speak Fusha (Modern Standard Arabic). One of the days we were there, he took us out on his boat to go fishing! I only caught one little fish, and Sonja did the same, but he caught several. He even caught a barracuda and a cuttlefish. We ate the fish that we caught for dinner. (Fish is an exception to my vegetarianism when it’s hard for me to find any other option here). After four nights on Masira Island, we took the ferry back to mainland Oman for what we had planned as the second half of our trip, visiting Musandam, an Omani exclave in the north. However, the ferry there was canceled due to the storm, and the amount of border crossings we would have to make made it impossible to go there by car. Instead we decided to stay an extra night in Muscat at a nice hotel called the Ramee grand. We visited the Matrah souq in Muscat, which I visited last summer, so I didn’t take any pictures. We went to some nice restaurants, and went to more beaches. I went to a Mexican restaurant in Muscat because I always miss Mexican food while I’m here. Honestly, it wasn’t as good as I had hoped, but it was still pretty good. I realized after that trip that it was my first long vacation on my own as an adult, and it was a lot of fun! It was cool to drive again, too, and cool to add driving in another country to my list of experiences. As usual, I’ll end my post with some other random photos that I’ve accumulated since then. On the weekend of March 4, I went with my friend Stefan to visit Dubai, also known as the “City of Dreams” and the “Paris of the Middle East”. I think it lived up to its first nickname (I’ve never been to Paris), although it was at the same time one of the strangest places I’ve been to. Believe it or not, Dubai is not a very far drive from Ibri! Since I don’t have a car, though, I had to rely on taxis and buses, which made the trip a little longer. 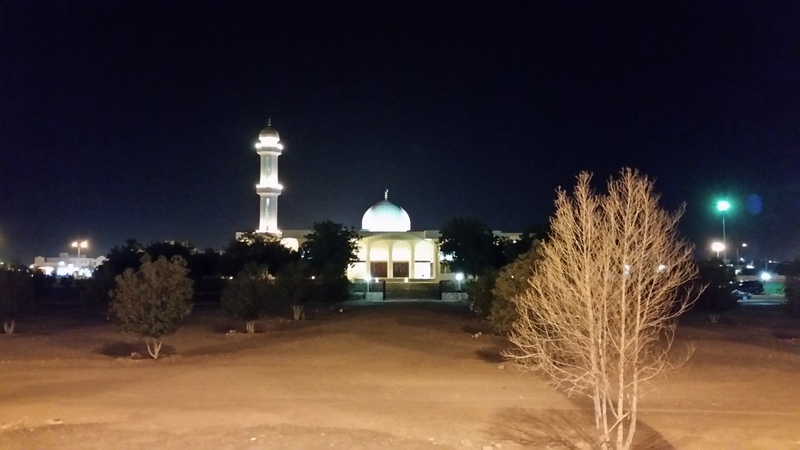 We started at 2:30 in the afternoon with taking a taxi from Ibri to Al-Ain, an Emirati city on the border of Oman. In fact, Al-Ain and the Omani city on the other side of the border, Al-Buraimi, were really part of the same city that was split apart when Oman and the United Arab Emirates were negotiating their borders. From there we took a bus to Dubai, and after a few confusing metro stops and a long walk we made it to our room at the Rahab hotel, a very basic hotel in a non-touristy area. We got to our room around 9:00, and were pretty tired, so we just at dinner at a Yemeni restaurant and then went to bed. It’s funny that I had never eaten Yemeni food before I came here, and now I’m pretty used to it. It’s generally a plate of yellow rice cooked with saffron, cardamom, and cinnamon among other things with meat on top (I always choose fish), and it’s always served with a very spicy sauce that’s like salsa but with a bit more tomato juice. I always prefer to eat it the correct way – with my hands! We started early at about 9:00 the next day (early for me) and took a taxi to the Dubai Mall. We had some nice samosas for breakfast at a little cafe near our hotel. We explored the shops until around 11:30, when we went up to the 124th floor of the Burj Khalifa, the tallest structure in the world! The elevator was surprisingly fast. All we really did was take the elevator up to the top, spent half an hour up there, and then went back down. But it was worth it! After that, we got lunch at, believe it or not, The Cheesecake Factory! Yes, I know that of all the amazing international restaurants I could have visited in Dubai, I decided to go for an American one. But, at that particular time, I was feeling very homesick, and I really needed some Mexican food. I had some very good nachos there; they would have been good even at home! I didn’t really have room for it, but I decided to get vanilla bean cheesecake for dessert, too. We went around to check out the Mall of the Emirates after that, to see most of the same types of stores. I didn’t really buy anything though, because I don’t really need anything! I did buy a few Arabic books, and some nice calligraphy pens. My favorite store was the Virgin Megastore, because there was an electronic drum set there, so I can at least say when I get back that I didn’t go an entire 4 months without playing the drums! I also bought a harmonica there to practice with since I forgot mine at home. As I implied, I’m not much of a shopper, but these malls really were incredible. All of the stores were huge, and there were even more impressive things in them. The Mall of the Emirates, for example, has a indoor ski slope! Crazy guitar I saw at the Virgin Megastore! The Dubai Mall has an ice rink! We rested in the late afternoon until the evening, and then we went to a cafe in the Emirates Grand hotel later at night to have milkshakes. 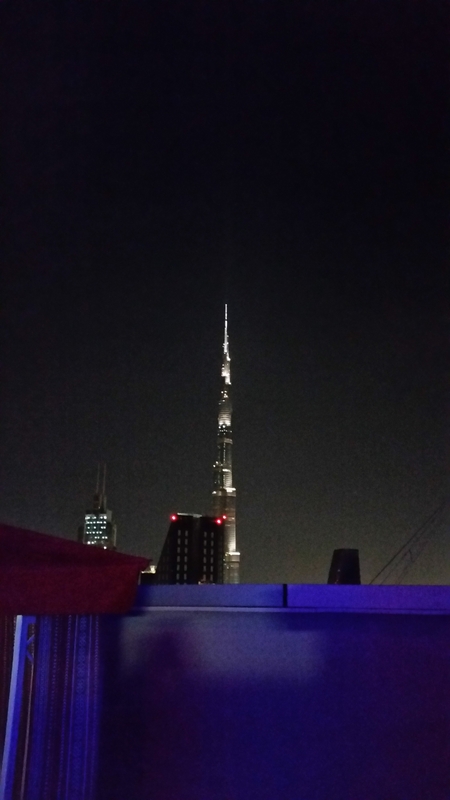 The Burj Khalifa at night, as seen from the Emirates Grand hotel! Here’s a video that shows the view from my hotel window – you can hear the call to prayer from a nearby mosque. In fact, it woke me up every morning at 4:00 AM because our window didn’t close very well! The next morning, we slept in and went off to the Dubai Marina very briefly, but that was all that we had time to do before we made our way back to the bus. We were able to take a bus with the Oman Transport Company from Dubai to Ibri, with a few stops along the way. That journey in theory was going to go relatively smoothly, but for some reason it seems as though whoever drove that bus had never driven that route before. They got us lost, first of all, exiting Dubai, which added about an hour and a half to our journey, then they almost drove through the border without stopping to let us buy visas! Additionally, all of the bags under the bus were searched by the Omani border guard when we returned, which was apparently just random selection. We arrived back home at about 11:30, when we were supposed to be there by 9:00. Now, my opinion! Dubai is really a beautiful city, and it’s definitely worth a visit, but at the same time, I think only if you are interested in blowing through a bunch of money! My first impression was that there’s not really much to do there other than go see shows, go to restaurants, and shop. Another interesting fact is that only 1 percent of Dubai residents are Emirati. It definitely seemed that way when I was walking around. Most of the people I saw there were either expatriate workers or tourists from all parts of the globe. Visiting Dubai made me realize just how rich the Emirates are, and I did get quite tired after a while of “Gold Class” this and “Luxury” that. Also, there was a very stark difference between the giant malls that I visited and the cheaper area of town where my hotel was, and I think the people living where I stayed don’t live the “Dubai life” that is advertised. Ask me when I get back if you want to hear more of my opinion on that matter. I do know, though, that I’d like to visit Dubai again before I leave. There’s much more there than what I was able to see in my brief time there. Last but not least, here’s some videos from when it rained in the past few weeks in Ibri! I’m quite behind in my blog posts due to internet issues, but I think that is all sorted out now, so be expecting quite a bit in the next few days! I’ll start by recapping a desert trip and including some photos from our other short excursions. In the next few days I’ll talk about my trip to Dubai, and in the following post my week-long vacation to Masira Island and Muscat. One of our trips was to the Bahla fort, one of the largest castles in Oman. I really enjoyed visiting this fort because we were able to explore all of the rooms, and there were quite a few interesting staircases and ladders to climb. In one room I found what appeared to be an old well – I dropped a little rock down it to see how deep it was, and it seemed like over a second before I heard it hit the bottom. I shined my flashlight in, and was greeted by a chirping bat, but luckily it didn’t attack me! The castle was very haphazardly organized, i.e. there was really no clear way to figure out how to get to one place just from looking at it, but after a lot of searching I found a ladder that took me up to the top of one of the tallest tower in the fort. We also visited a mountain village after Bahla. The trip to Bahla was just an afternoon trip if I recall correctly. Our desert trip on February 25-26 was longer. We started that trip with a visit to Jabreen castle, considered one of the most beautiful castles in Oman. I wasn’t able to appreciate it completely though, because I was a little sick from eating an ice cream bar that contained hazelnut chocolate, which I didn’t realize before I ate it (I’m allergic to hazelnuts!). Since we’re talking about castles and forts, I’ll add a funny anecdote here. In my first few weeks in the program, I learned two new words, the word for castle (حصن, HuSun) and the word for plate (صحن, SaHan). You might be able to see from the Arabic writing, that these words are the same letters but in a different order. When I went to a Syrian restaurant near our apartment, I accidentally asked for a Falafel Castle instead of a Falafel Plate, which the restaurant employees thought was very funny. Sometimes I still get the words confused! After our visit to the fort we arrived at the desert camp and went dune bashing – one of the men from the camp took us driving very fast over the sand dunes in his truck! It was a lot of fun, quite rough, and a little scary. The camp was nice, especially because we were the only ones there. We had a nice buffet dinner, and sat and talked afterwards. I went out for a walk in the desert by myself at night as well. I think I’m attracted to the desert because there’s no place that’s so quiet and isolated – there were no sounds around me, and almost no life. It was a good place to meditate, although I had to shine my light around every few minutes to make sure there were no scorpions around! The best thing about the desert camp was that I was able to put my mattress on a bed frame outside, and sleep under the stars. I even saw a shooting star. We got up early in the morning to watch the sunrise. It was a very difficult walk up a few dunes, but it was worth it. We also visited Wadi Shab, a large river/canyon that I visited last summer in my previous trip. This time, however, I was able to swim to the end of the wadi to see a waterfall inside of a cave! It was beautiful, but of course, I couldn’t take any pictures.